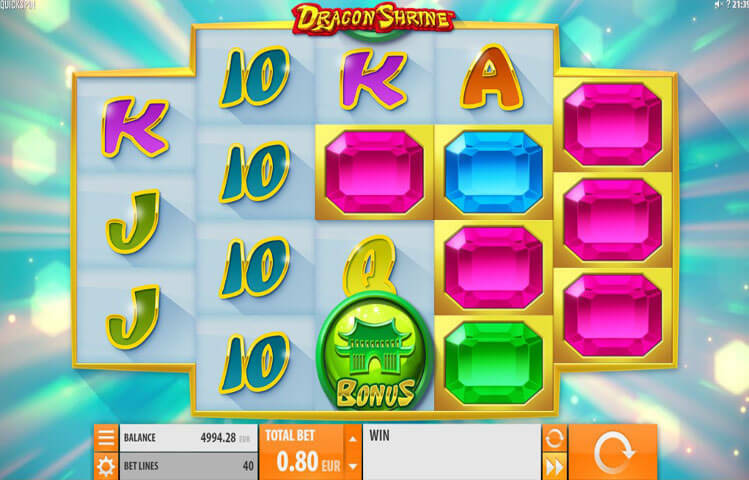 Dragon Shrine is a 40 lined, 5 reeled Quickspin powered slot machine. This new game by the developer has a Chinese theme that comes with a modern twist and visuals style. The game has the Dragon Stack Re spin round, which can be very rewarding. There is also a free spins round, plus a lot of rewarding symbols that give a lot of lucrative line payouts when matched on the 40 lines of the game. This game is playable from 0.20 up to 80 credits for each spin. It can also be played across multiple platforms including desktops, tablets and mobile phones. So get ready for a fun Chinese themed experience that is pretty rewarding, modern and exciting through this Quickspin title, Dragon Shrine. Dragon Shrine is the newest game by Quickspin. This new game has a five reeled setup that houses a total of 40 wager lines for players to place their wanted bets on. Players will be able to place those bets with ease at the control panel of the slot game. They will do that by going through the single betting option of the game, at the Total Bet Cell. This bet varies between 0.20 and 80 credits for every single spin. Another unique thing about the game is that the 5 reels do not have the same number of symbol rows. This is because the 1st and the 5th reel have 3 symbol positions, while the 3 middle reels have 4 symbol positions. The control panel of the game comes in orange, under the reels. The buttons include the paytable, the bet, the auto play function, and of course the spin button. Dragon Shrine has an Asian theme, but it is presented with a modern twist with modern visuals. This is why players will not see many ancient dragon symbols and Chinese artifacts. Instead, they will be seeing one red dragon icon, and the rest of the symbols are precious gems and jewels, from the riches of the Dragon Shrine. There is also the usual low paying card symbols. All of the different payouts that these symbols can give can be viewed at the paytable of the game. The 5 reeled setup of the game itself is found in a calming realm with nothing but the sunlight, and the clear blue sky in the background. This surely creates a calm and a relaxing experience for the players. Dragon Shrine has a golden Wild icon. This wild icon can substitute for all other icons, except other special ones. It can do that in order to create the biggest payout possible according to the rest of the icons on the reels. There is also the Bonus Scatter symbol, which comes in the form of the Chinese house. 3 of these bonus scatters landing on reels 2, 3 and 4 would trigger the free spins round where players will claim 10 free games. There is also the Dragon Stack Re Spin feature that can be triggered by the Dragon icons.